greatest ever servants. However because of the wonderful work at underage level in Tubber many of our young talents are emerging at minor and under 21 level as real stars on the county scene. But going back to the beginning it was John Moran who first represented our parish at senior inter county level. John had helped found the club in 1979 and was asked that same year to join the Offaly under 21 panel. Offaly won the under 21 Leinster Final that year.They lost by a single point to Cork in the All-Ireland semi-final.As John himself said,"it was disappointing losing the semi final but the team went on to form the basis of the successful teams of the early 80's with names such as Thomas O'Connor, Matt Connor, Johnny Mooney, Brendan and Michael Lowry, and Gerry Carroll, to name but a few". John himself was brought on to the Offaly senior panel in 1980. He played in the League that year for Offaly but it was in 1981 when he made his championship debut against Westmeath in the first round playing centre-field. Remembering 1981 John says,"The highlight of that year was coming on in the All-Ireland Final, unfortunately losing out to the great Kerry team".The following year John won the O'Byrne Cup with Offaly but he later broke his ankle and did not rejoin the Offaly panel until the Leinster Final. He remained part of the panel throughout the rest of the season in that historic year for Offaly football. John played up until 1985 with the Offaly seniors but retired after that because of family commitments. However he continued to play with Tubber and was an integral part of the team in the important years to come in the history of Tubber GAA. While John was playing with the seniors Paddy Sheridan and Padraig Farrell were representing Tubber on the Offaly minor panel. In 1982 they were part of the Offaly minor team that defeated Wicklow in the first round of the championship by 4 points. However they lost narrowly to Louth in the second round.The following year again both Paddy and Padraig were recalled to the minor panel. In the 1983 minor championship they once again defeated Wicklow in the first round.They beat Longford in the next round by 3 points.They were now in the Leinster semi-final playing Kildare.The first clash ended in a draw but Kildare won the replay by 3 points. In 1985 both Paddy and Padraig joined the Offaly under 21 panel.After beating Wicklow in the first round they lost the second round to Carlow by a point. However 1986 was to prove a year of real success for the Offaly under 21 team when they reached the All-Ireland Final, with Padraig and Paddy still representing Tubber on the panel.They defeated Wicklow in the first round by 7 points and went on to beat Meath by 2 points to set up a Leinster Final clash with Laois. The first game was a draw but Offaly emerged as winners by 3 points in the replay. Offaly were drawn against Mayo in the All-Ireland semi final. Again the first game ended level. Offaly won the replay convincingly by 11 points. Cork were now all that stood between Offaly and All-Ireland glory. However in a tough fought final it was Cork who emerged as winners by 7 points. By 1988 Padraig Moran had been playing with Tubber for four years despite being only 15 when he stared. In '88 Padraig was called on to the Offaly Under 21 and Senior panels.This was the beginning of a very special year for Padraig, for Tubber and for Offaly. Padraig fondly remembers the "tough training sessions under Jody Gunning but he showed great loyalty to us". It was this loyalty that would prove so important in the campaign to come.They played Longford in the first round of the Leinster Under 21 Championship.They won and went on to play the next round against Westmeath in Tullamore. For Padraig this game held special significance.As he says,"you can imagine it was not hard for a Tubber man to get psyched up for a game against Westmeath. I was playing corner-back and marking Fintan Shorthall from Caulry who I played with in the Carmelite College. He was taken off and I was then marking Brendan Madden from Moate, who I also played with in the Carmelite".To Padraig's great relief Offaly beat their neighbours that day in Tullamore. Next was the Leinster semi-final where Meath awaited them.This was one of Offaly's best games and they defeated Meath in a very tight contest. Offaly were to play Wexford in the Leinster final in Dr Cullen Park in Carlow.This was to be the first installment in an epic saga that the entire GAA nation turned to see the outcome.The first game ended in a draw and the replay was fixed for the following weekend. In the replay again the sides were level after normal time and extra time was needed. However this ended all square as well.The second replay went the same way as before with the teams unable to be separated again after extra time had been played. By now the attention of the whole sporting nation was firmly fixed on the clash of Offaly and Wexford for the fourth time. Padraig remembers that "the following weekend, part four of the saga, every man, woman and child ended up in Carlow. This game was my best ever for Offaly. We managed to win it in normal time.What a relief but we were all in bits at this stage". But there was little time for recovery as they had to play the All-Ireland semi-final nine days later against Kerry, who had the great Maurice Fitzgerald playing for them. Offaly were rattled by Kerry early on and slipped behind by 7 points. But they clawed back the deficit to end the match level with Kerry. Another draw! The following Friday the replay was played in Bruff in Co. Limerick. Padraig says "that this time the fear factor of playing Kerry was gone and we were well rested up for the game.We ended up beating them in a frantic hard hitting game. Cavan were already in the All-Ireland Final and to be honest with the amount of games and drama there was only going to be one outcome. People came from America, London and everywhere for these games because you could not write the script". And soon after a long hard road Offaly eventually beat Cavan to lift the Under 21 All-Ireland. It is one of the greatest achievements on Padraig's behalf for any Tubber man to go so far and represent with such distinction his parish at the very highest level. Padraig went on to play for the Offaly senior team at full-back and full-forward up until 1994 but in his final two years with the county he was often hampered by injury so he retired from the county scene to focus on playing with Tubber. Gerry Robbins represented Tubber on the Offaly minor panel in 1988 and 1989. 1989 was a big year for the Offaly minors as they reached the All-Ireland Final.They played Kildare in the Leinster Final.After a convincing win over Kildare they played the Munster champions Kerry in the All-Ireland semi-final. Beating Kerry, Offaly went on to play Derry in the All- Ireland final. However they were well beaten by a Derry team captained by Anthony Tohill. Gerry made appearances from the bench throughout the campaign. He came on in the Leinster semi-final to score two points and help Offaly through. Martin Heavin also played at inter-county level. 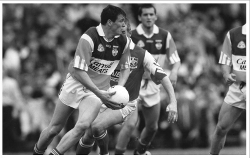 In 1996 Martin played for Offaly in the League and Championship. But their championship run did not last long when they were beaten by Louth. In 1998 Brian McManus represented the club at under 21 level for Offaly. They lost to Laois after a replay. However that Laois team was to go on to contest the All- Ireland Final that year. By the turn of the century in 2000 the strength of Offaly football teams had began to wane and it was proposed to place a greater emphasis on youth development within the county. And so Tubber did the same. And so in 2005 the first signs of underage progress were to be seen as the Offaly minor team reached the All-Ireland semi-final. Four Tubber players were on the panel, a record for the club and a measure of its growth in underage success within the county. Since 2005 Tubber has had a representative on the minor panel every year. In 2005 Keith Higgins, David Kavanagh, Brian Kelly and James Guinan were all part of the Offaly minor panel that reached the All-Ireland semi-final.They played Laois in the Leinster final where Keith started corner-back and both Brian and James were brought on in the second half. However after losing to Laois narrowly they went on to play the Munster champions Cork in the All-Ireland quarter final. Keith again started corner-back. James was brought into the game in the first half and Brian came on in the second half to help secure a great win and a place in the All-Ireland semi-final. Unfortunately they came up against a very strong Down side that went on to win the All-Ireland. In 2006 the Offaly minor reached the Leinster Final again. Brian Kelly was wing-forward for Offaly in the final against Meath. Once again luck ran out for the young Offaly side and they lost another Leinster final for the second year in a row. They were up against the Ulster champions Donegal in the quarter final. Brian was again wing forward and after a great game Donegal just edged Offaly out. 2007 saw three Tubber players on the Offaly minor panel. Lee Dunning, Noel Browne and Brian Kelly were selected for the panel and all three featured in the first round against Wicklow. Unfortunately for Lee he suffered a bad injury against Wicklow which ruled him out for the rest of the championship. Offaly went on to reach the Leinster semi-final but lost out to Laois. Noel was full-forward and Brian was wing-forward. In 2008 Lee Dunning was back on the minor panel and was joined by Bernard Allen. For the third time in four years the Offaly minor team was back in Croke Park to contest the Leinster final. Both Lee and Bernard started throughout the campaign, with Lee lining out at corner-back and Bernard starting corner-forward. Frustratingly for Offaly they were again beaten in the Leinster final by Meath.They faced Kerry in the All-Ireland quarter final but the Munster champions proved too strong for the Faithful side. Bernard Allen was back on the minor panel again in 2009. He played corner-forward again for the championship campaign. They reached the Leinster semi-final against Dublin. In a tough fought and close game that went into extra time Dublin ran out winners in the end. This year Lee Dunning, Bernard Allen and Brian Kelly all graduated to the Offaly under 21 side. Both Bernard and Brian started corner-forward and full-forward but were beaten by Carlow after extra time in the opening round. Boasting one of the longest intercounty playing careers in the country, CiarÃ¡n McManus has been one of the driving forces behind Offaly football for the past sixteen years and without doubt he deserves all the plaudits in the world. Since making his debut in 1996 against Louth in Pairc Tailteann in Navan, he has been a guiding light in the football ranks for Offaly and even if the silverware has been few and far between in the past number of years his dedication and passion for the Offaly jersey never wavers. It was obvious from an early age that CiarÃ¡n was in it for the long haul.A member of the last under 21 team who brought honours to the county in 1995, he went onto win a Sigerson Cup medal with UCD in 1996, a Leinster Senior Football medal in 1997, a National Football League medal in 1998, a Dublin Championship with UCD in 2000, a Division Two League in 2004 and Division Four League in 2008 while along with captaining the county to the 2004 League campaign. club and county in seven series, playing fourteen games in all, in the International Rules campaign against Australia. When CiarÃ¡n first came into the fold Offaly were starting to get their act together, but since the turn of the century, matters in the Faithful County has been far from right. But to this day CiarÃ¡n's hunger, passion and determination for the cause of this county is still as strong as ever. With a driving ambition, no amount of words can sum up what this man has done for Tubber and Offaly as a whole. Instrumental in many an Offaly win over the past 16 years, who will ever forget his amazing goal against Donegal in the League semi-final in 1998. But that is only a drop in the ocean as to what he has given to the Faithful County for almost two decades now. To date, he has played a whopping 103 League games in the County jersey passing his milestone of 100 League outings on 14th March 2010, after making his debut in the 1995/1996 League campaign against Tipperary. Remarkable to say the least, but even more remarkable is the fact that he has featured in every one of Offaly's League campaigns since his debut and this alone places him above and beyond any other current intercounty player. Up to now, CiarÃ¡n has made 175 appearances for the Faithful County and some sixteen years on CiarÃ¡n is still as passionate for the cause of the county.There is no doubt that there are many more games to come for this stalwart of Offaly and Tubber GAA.